One-by-one, farmers step forward. Some look puzzled and others stare boldly at the strange camera's tiny lens. 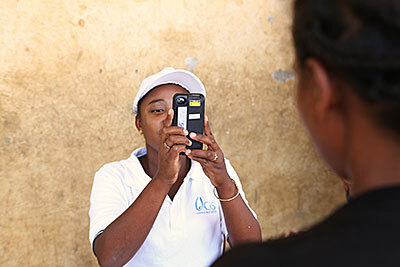 The shutter clicks, and members of Catholic Relief Services and partners Caritas Madagascar and ODDIT—the Diocesan Organization for the Development of Toamasina—tap names and other vital statistics on the iPod's small screen. They are pairing the farmers' photos and information to barcodes. The farmers confirm their information with a signature, and the ones who can't read sign the touchscreen with an X. In return, each farmer receives a perforated sheet of color-coded vouchers worth about $14—about 14 times their daily income. Its planting season, and more than 1,330 farmers, 70% of them women, have arrived at the CRS-sponsored seed fair in Brickaville, a village on this island nation off the east coast of Africa. These farmers had lost up to 90% of their crops to Cyclone Giovanna in early 2012. With no cash crops available for sale, they quickly ate the seeds they had saved for planting. In the aftermath of a major emergency, small investments, like getting seeds into the hands of farmers, are critical to helping people repair their lives. Seed fairs provide farmers the opportunity to not only purchase seeds for the crops they've lost but also try less familiar crops. The iPods help streamline the process and eliminate the possibility of someone trying to scam the system. "With the barcodes, you can't falsify. A quick scan, and we can tell which ones have been used and if one has been faked," says first-time iPod user Santoné Angesilas, a coordinator with CRS partner ODDIT. "You can't scan a code twice, because a warning message will pop up." Crowds of farmers swarm around vendors sifting through pigeon peas, rifling through seed packets and comparing varieties of corn kernels. Albertine Sampy, 41, squeezes past the bustling stalls on the lookout for cuttings of manioc, a popular crop that was wiped out during Giovanna. In the aftermath of the storm, manioc cuttings were scarce and expensive. At the seed fair, they are an affordable $3.25. Albertine sifts through her stack of vouchers and pulls out three green and one pink one to hand to the vendor. Color-coded vouchers are tied to Malagasy currency. The barcodes contain all of Albertine's information. When the vendor hands the vouchers over in exchange for a cash payment, CRS and partners will be able to cross-reference the transaction with the purchases that Albertine reports at checkout. Data gathering during and after a seed fair used to be time-consuming. "It used to take 3 to 4 hours followed by 1 week of inputting data," says Angesilas. "Before, when we used paper, we had piles of information to copy. There was more room for errors, because every time you can't read what someone has written, you can't correct it. You can with an iPod." The information gathered on the iPods will also help track purchasing trends, facilitate data analysis and help CRS and partners plan for future aid. "[The iPod] will help us develop new solutions because we'll already have information on the members of the community, and that will make future responses easier," adds Angesilas. "We'll be able to identify what seeds were collected in each zone and what the community prioritized, and where the gaps are." Albertine approaches the seed fair checkout, her arms loaded with manioc, seeds for three varieties of greens, pigeon peas, vegetables and corn. She hands over her white identification card to Angesilas, who aims the scanner-equipped iPod at the card. A red laser registers the barcode with a beep, and Albertine's photo flashes up on the screen. Angesilas tallies up each purchase, cross-references to the total amount she received in vouchers and scrolls through a list of questions that will help inform future seed fairs. Among the questions: What seeds interest her most? Like 20% of other seed fair participants, she is excited about trying new varieties of seeds. "Because of the iPods, we've learned that farmers are interested in learning new techniques and trying new seeds," says Haja Radaniela Andrianoro, a CRS project officer. "We can use this information to create new projects to target communities interested in this information." 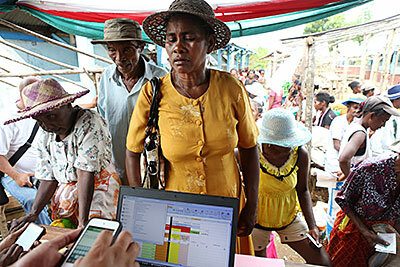 It takes about a dozen ODDIT, Caritas Madagascar and CRS employees to run the seed fair, which includes farmers paying for seeds, sellers exchanging vouchers for cash and staff uploading data from iPods to PCs. Staff moves quickly. They have to. Even with fully charged electronics, lack of electricity is a concern. But with experience, the staff has it down to 1½ hours from start to finish. 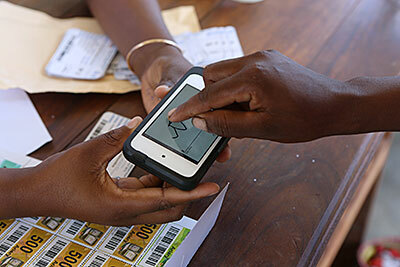 With checkout complete, Albertine carries her purchases the short distance to her sister's home. Tomorrow, she'll use a stick to poke small holes in the ground and place three corn kernels in each. The winds will take care of covering them with soil. Albertine says the seed fair has helped her to extend her plantings, buy scarce manioc and try a new crop of pigeon peas. "It's hard for me to go to Tamata [the closest large town] to buy seeds," she says. "And when I do, they are not of good quality. I know these seeds are good quality." She plans on dividing her future harvest for three uses: consumption, sale, and seeds to store and use in next year's planting season.